Two-letter words are one of the most important parts of playing Scrabble. If you don't know all of the small ones, then you're missing out on one of the easiest ways to score big. Check out How to Score Big with 2-Letter Words in Scrabble and memorize all that you can. Definitions are optional, but you won't need them for this challenge. The following puzzle uses the North American dictionary (OSPD4) and word list (OWL2), and was designed by Joe Edley, three-time winner of the National Scrabble Championship, in The Official Scrabble Puzzle Book. It's a great book for sharpening your skills on the board (compared to just Scrabble anagram puzzles). Play each two-letter word on the board below individually and try to get the highest score for each move possible. Remove the two letters played before trying the next set of two letters. Then add your scores together to get your total points. Post your answers and score in the comments below and let's see who's a master Scrabbler and who needs a little more work with the two-letter word list and parallel moves. Scrabble Challenge #4 had no answer. It was just a fun game of Scrabble Sprint to help you with your speed. Good job. The max for individual plays is 113 points total. 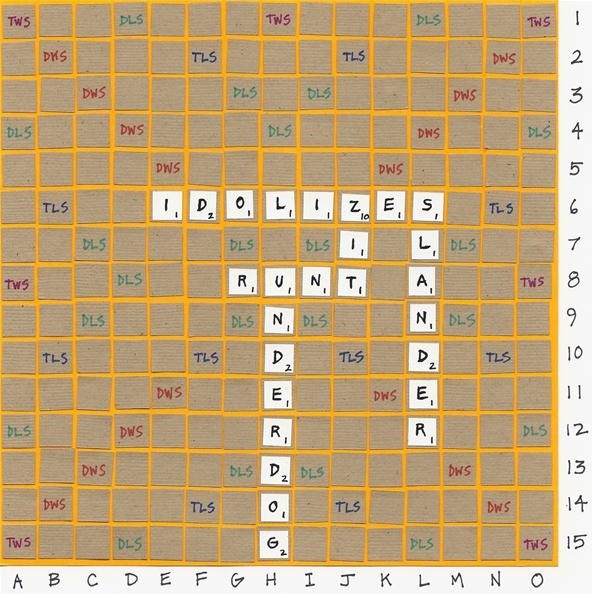 Looks like you played them all on the board together, which is why you're getting the higher score (otherwise, you'd wouldn't have been able to play LO on J10). Guess the instructions could have been a little clearer, haha.